The new Nexus 5X and Nexus 6P are now finally official, and this means that their support pages at Google are also now available. What these give us is some neat information about how the two new Nexus phones will ship and what will buyers find in the final retail box. Keep in mind that pre-orders for the new handsets are now available, but shipping times have slipped to early November for most models (it was late October for the first to pre-order). 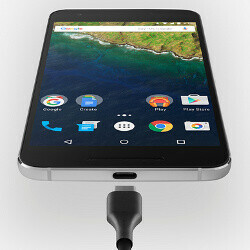 What's notable is that - with the Nexus 5X - you get only a USB Type-C to Type-C cable, meaning that there will be no way for most people to connect their phones to a computer with a traditional USB port for syncing. That's a bit of a bummer - this would mean that most of us would need to buy a separate cable to connect the USB Type C phones to your desktop or laptop. The Nexus 6P does have two cables: both a USB Type-C to Type-C AND a USB Type-C to Type-A, so no worries with the larger phone in the 2015 Nexus family. We do, however, like the fact that there is a powerful, 15-watt charger in the box. Google has officially confirmed that the Nexus 6P charges fully - from 0% to 100% - in just 97 minutes, an hour and a half, and the first 45 minutes are especially fast. Oh yay let's use a proprietary cable for charging and syncing. I don't see ths problem, I primarily use wifi to sync. Only time I use cables is when doing a full back-up or tinkering with Cyanogenmod. Since when was USB considered proprietary? But it's not (or will not) be proprietary in the near future. Any Android flagship worth its weight will have usb-c in 2016. Even computers will have the same port including Apple's. And I wouldn't be surprised if the iPhone 7 uses it as well especially once they include fast charging. This cable/connector will be the gold standard and it's about time. We are just in the early stages of the change.
" a proprietary cable for charging and syncing" USB. the U is for Universal so it is not proprietary. Is it too hard to get this simple fact? However, lightning is proprietary. Bad troll anyway. Wow that's super fast, Good job Google keep innovating. 3A for the charger!!! holycrash! if i have a samsung's 2A it would be much longer then those 90 mins. The numbered images do not match the numbered list. So to be clear, does 6P support usb 3.1 protocol? For fast 10GB transfer and up to 100mA charging ? I said UP TO! That means device will always detects what current needs.. I have samsung charger where says adaptive charging, that means if device can manage or is allowed to charge in higher current it will switch to higher current.. Yeah they confusing because it is gimmick..
Aah Sorry ! So they upgraded standard max 2A to 3A nice. Up to 100W usb 3.1 should be capable to charge laptops and ultrabooks..
100W if 20V ! This is still 5V, so 3A Max for 5V. Their reddit response was Nope! Only USB 2.0. Another downer. Premium price with a lack of headphones..